From urbanation's twitter feed today, not certain if there's an existing thread...couldn't find one. Another tower for Traynor to render in future Yorkville views? I was wondering when that corner would be developed. It's currently a large area of trees and grass between 66 Isabella and the Town Inn on Church. I would have preferred to see some cool looking townhomes fronting along Isabella and up Church but I guess the land is too valuable for that. Wow, with all the other projects proposed or under construction within a couple blocks, this is turning into quite the dense area. ^ I was thinking the same thing so I did a count. 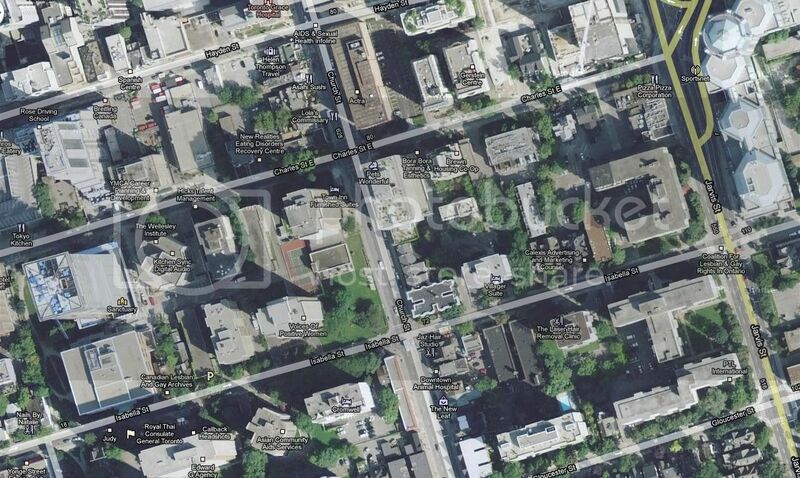 In the general Bloor/Yorkville neighbourhood there are 21 residential towers in the works. I was wondering when that corner would be developed. It's currently a large area of trees and grass between 66 Isabella and the Town Inn on Church. Does anyone know if there other examples in the city where a rental building has condo units on top? Will this be a new trend? This development was mentioned at the first community meeting regarding the proposed condo development on Church between Dundonald & Gloucester Sts. that will wipe out the heritage homes. This I would fully support as opposed to the demolition job at 580-596 Church. Rezoning application to construct new mixed use building with retail at grade fronting on Church Street - Building is 32 Stories Containing 212 dwellings - Having 196 Rental Units, 4 townhouse units on ground floor and 12 condo units on top 2 floors - 166 parking spaces - 2 levels below grade parking. I'm glad to hear it has retail along Church Street. Ya, I'm not a big fan of the project that's tearing down those big heritage homes either. I think they're goin to demo a nice old 3-storey apt bldg too. I wish they would have turned that lot into a public park, the area needs more wide open spaces. The parkette is usually full of homeless/drug users, and the aids memorial park is a dog park. And at Pride everyone uses that greenspace to just chill in the shade anyway. Ah well.. I hope the design is good at least and doesn't kill the Village's 'village' feel. Regardless, I'm starting to find Queen West a lot more attractive! I haven't heard of anyone who is a fan of this proposed project, and it's nowhere near a done deal yet as there is plenty of strong opposition against it. I wish they would have turned that lot into a public park, the area needs more wide open spaces. The parkette is usually full of homeless/drug users, and the aids memorial park is a dog park. And at Pride everyone uses that green space to just chill in the shade anyway. Ah well.. The more green spaces the better, agreed, however there are more green spaces and parks in the area than you'd find in your average suburban neighbourhood. What parkette is full of homeless people and drug users? Don't know what your talking about there. Finally, the aids memorial park is called Cawthra Square Park, and it's not a dog park. There is a dedicated fenced area in the back corner of the park for dogs to play, I very rarely ever see dogs in Cawthra Sq. Park since the dog area was built 3 or 4 years ago. For me there are two big questions about this project. The first, like always, is about the proposal's architecture: who's it by? what's the massing like? what's the look? What is more important to me here though is the site plan: how much of the lot do they propose to cover? will any green space be left? will any remaining green space be made public? While not as significant a spot as the land that is becoming a new park at the northwest corner of Bay and St. Joseph in conjunction with the development of U Condos, this is still a bit of visual breathing space on Church Street that many will not like to lose. U Condos' final plan was preceded by a very bad proposal for the site which changed because local residents got involved in negotiations, a process which may soon be underway here too. When I think about this proposal it all seems a little perplexing. This is a pretty tight site and if I'm not mistaken I think that there is already below grade parking under this space which serves the two existing towers (66 Isabella & The Town Inn Suites). I'll look the next time I'm by but I'm pretty sure there are a couple of exhaust ducts around that area of the property and an emergency exit from the parking levels. Yep, there are two levels of parking underneath the location. The aging garage will probably be reconfigured to handle a few more spaces but it looks like there won't be any sizable increase to reflect the additonal units. Maybe that's why it's proposed as rental. All the owner needs to prove is a surplus of existing space to get approval. Although, there are condos being erected with no parking whatsoever. They just put up the signs for this project and it says the proposal is to construct a 32 storey 'addition' to the existing 26 storey building. It also states they will be adding 72 parking spots. I predict this will become a trend over the next 10-20 years...ie, filling in 60s tower open space with new highrise rentals. That building at Spadina and Lowther started the trend iirc. Good to see.